Make your business look its best when you make direct contact with men's, women's, boys', and girls' clothing stores and shoe stores using this apparel stores email list. They influence what people wear, and with this list, you can influence what they buy. To make a successful foray into the world of fashion, your business needs to find the most important people to talk to. But why waste time data-gathering when you could be making sales? Just buy this clothing and accessory stores email database and you'll be able to skip to the part where your business shows off its products to key players in this industry. With our pre-built clothing retailer mailing list, you'll get a wealth of information that you can use to form new B2B connections with potential customers, including their real names, direct email addresses and phone numbers, mailing addresses, and details about their business. Just download this .CSV file, hand it off to your sales team, and let them get to work! For those who'd rather conduct a more targeted marketing effort, filter this comprehensive business database to create just the B2B email list you need with our list-builder tool. 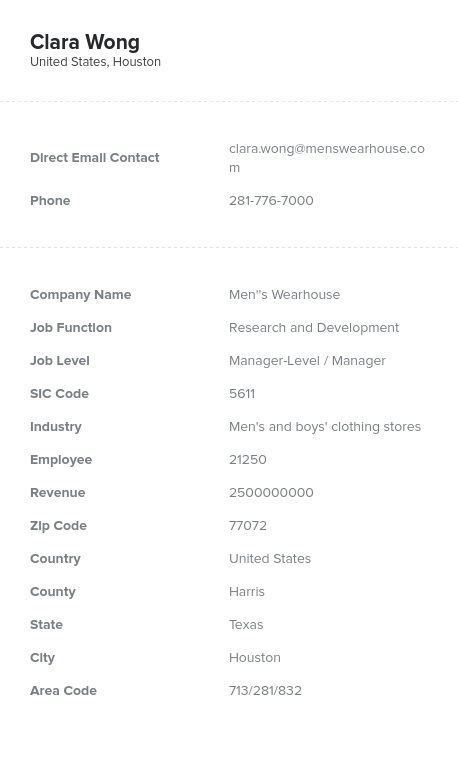 With it, you can create a customized apparel store email list tailored to your goals, whether you want to find sales leads specializing in menswear, managers of retail outlets that sell children's shoes, or all types of apparel stores in a specific location. At Bookyourdata.com, we can give you a lot of data, but we don't believe in quantity over quality. That's why every business list we sell is double-verified, first by computers and then by hand, to get rid of outdated or erroneous information. We go the extra mile to make sure that our lists are accurate!